It is this time of the year where I am reminded that it is good to be French. I took a long week end in Caracas for work but also because it was "le 14 juillet" party at the French embassy in Caracas. That is, for you US folks, Bastille Day. French embassies across the world usually hold two receptions, one, private, for the diplomatic corps and high national functionaries of the residing country. And the other one, an open house of sorts with pre-requested entry pass, for the French community of the place. For once I was able to make it, actually a record of sorts, two years in a row. It is a very sought event because the French embassy flies in pâté and cheese from home, and even champagne is served for the toast. Of course, the ambassador makes a speech, takes the opportunity to pin a few medals on worthy recipients, we all thing a thrilling Marseillaise and then the buffet opens. It is always the opportunity to see people we have not seen in ages, and that we are not necessarily wanting to see until next year. Because there is an interesting phenomenon here: most guests are long term residents of Venezuela, for at least 5 years I woudl guess. More recent arrival are still not home sick enough, or already left for the annual vacation, preferably back to France. 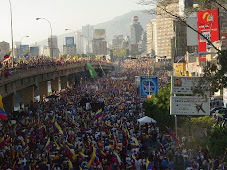 But for those of us who have made our lives in Venezuela and we are following Venezuelan schedules, over the years Le 14 Juillet is our meeting date, our memory lane moment of the year. 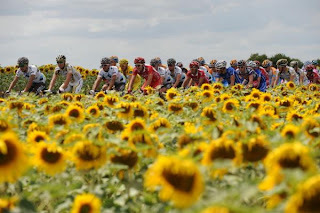 But there is also something else that can make your July memorable if you are French and if for some obscure reason you can stay home late in the morning, say until 10 AM: Le Tour de France. True, you also need a cable service that carries TV5, the French broadcast to the rest of the world to enjoy the experience live, and hold on!, WITHOUT commercial pauses!!!! For as long as the day's race lasts. But I am not really a bike fan. What really attracts me to the coverage for a few days in July is the filming. The Tour is designed to snake through the most beautiful countryside and the most awesome landscapes of France (with a few brief outings outside the borders for a couple of days). With the technology of still camera filming today, and the French tradition of the Michelin guide which makes sure that the airborne guide knows the name of every little chateau and old stone houses village he flies by, the story of every gourmet produce of the area the bikers cross, it becomes fast an almost ecstatic moment. France never looked so beautiful and rich than it does now in July. Not to be chauvinistic but I doubt very much that any other country in the world can offer such a complete frame for an event like the Tour as France. Not to mention the cheerful crowds all along the way, coming from all around Europe now. For today's stage, watching as I was fixing up to come back to San Felipe, we flew though the "Sancerrois", the country of the Sancerre wine and the Crottin de Chavignol cheese. A rural area usually scarce in foeign tourists. There was almost a chateau every 2-3 miles, old villages and small "bourgs" everywhere, and best of all the Loire River, now a UNESCO heritage as the wildest "fleuve" of Europe. Fleuve is the name we give to the main river, the one that does not change its name from its start to the sea. One image, not that great perhaps but so telling, was of a few canoe tourists, on a sand bar in the middle of the Loire, their yellow canoes disposed as a star, watching the Tour as it went through the bridge above them. Simply stunning! On the road back to San Felipe today, as I was dodging the humongous potholes everywhere, even on the speedways, I was stunned at how far Venezuela is from France, and how we are falling back while France somehow seems to keep going forward.